Canik Elite Combat, with too many extras to fit in a photo caption. 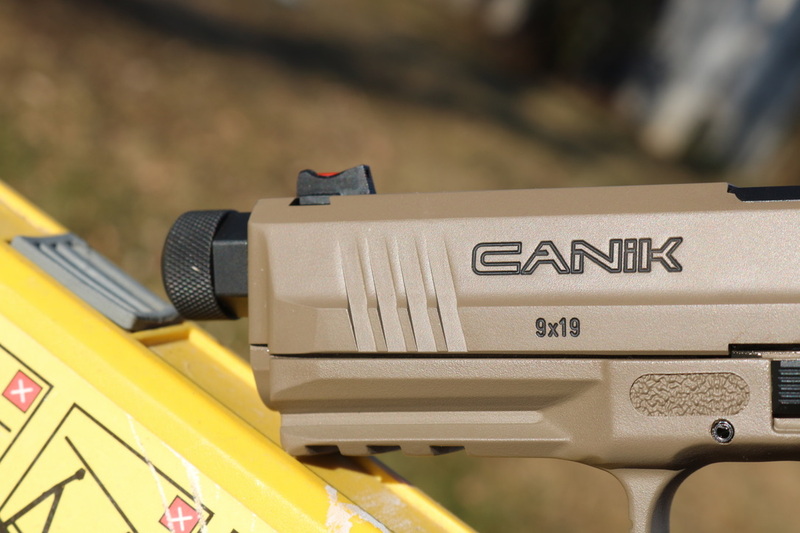 Canik is one of the newer players in the striker fired gun world, at least for the US market. In an already crowded field, they have taken some pretty serious ground via a combination of hard-earned reputation and value for the dollar. Imported by our friends over at Century Arms, the Canik brand has proven not only solid but highly adaptable. 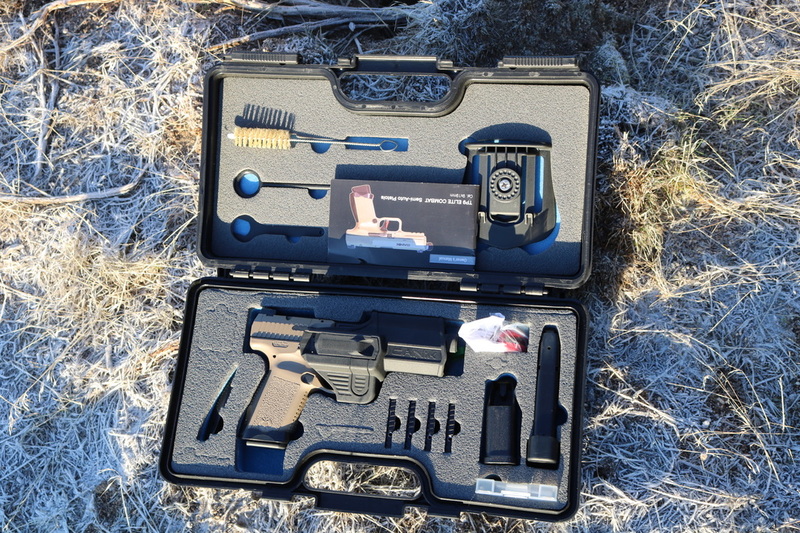 First, they came with the economy class of guns, with an MSRP of $399.99 for a TP9SA. Then they introduced a match ready race version, which received a positive rating from our own Patrick Kelley, at an insanely low MSRP of $554.99. And now they have a new flagship model, the Canik Elite Combat. The Elite Combat comes in a very nice hard plastic case, with top-notch laser cut foam for all the goodies. The top of the case features the paddle for the included holster, cleaning kit, and thread protector wrench. The bottom of the case has enough add-ons to make James Bond jealous. The pistol ships in the holster, which we will get to in a moment. It has too, in order for all the other kit to fit. In the gun is a standard capacity magazine, while an extended plus three mag is jammed up against the far right side. The second size of backstrap is set next to the pistol’s grip on the far left. Standard goodies ( for most guns these days) are a trigger lock and magazine loader, fit in next to the extended magazine. Then we get to the things that set the Canik Elite Combat apart. There are four red dot sight bases included because the Combat Elite is….. ( drum roll, citation needed) cut for red dots from the factory. One of my favorite features of modern era pistols, if still abnormal from the factory. I feel like this is excellent value for the dollar, giving you the option to try a red dot without a $300 customization. Or let your pistol grow with you, as you add more money to your arsenal. Next to the sight bases is a plastic box, which contains multiple sizes of magazine release, further tailoring the Elite Combat to your needs. Pulling the Canik Elite Combat out of the box, the first striking feature is the paint job. Canik settled on a “black and tan” motif for this model and pulled it off in the way of a beautiful gun. The slide and frame are FDE, with the steel slide being Cerakote over black nitride. All the controls, barrel, and half the trigger are black, with the trigger safety in red, a nice accent. The biggest news about the Elite Combat has to do with the partner Canik chose for some of the parts. 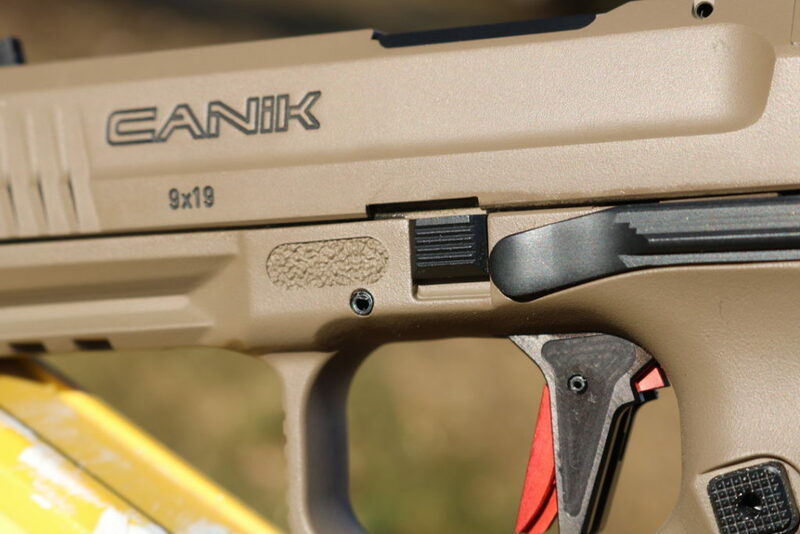 In a very surprising turn for a brand that is often looked at as the lower price option, Canik teamed with Salient Arms for design and critical components. 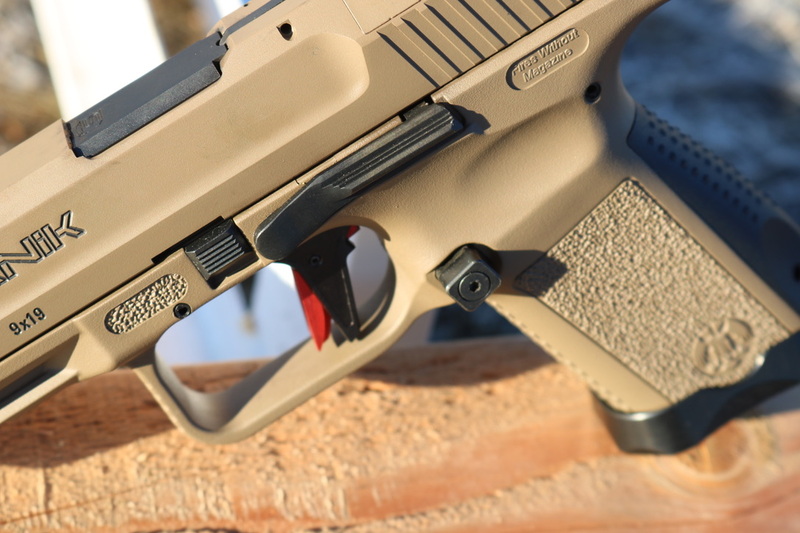 Salient Arms, if you aren’t familiar, is a custom shop that will build you a $2500 Glock. Or sell you a Glock barrel STARTING at $359. Salient Arms was responsible for the bolt on magazine well, barrel, and sights. 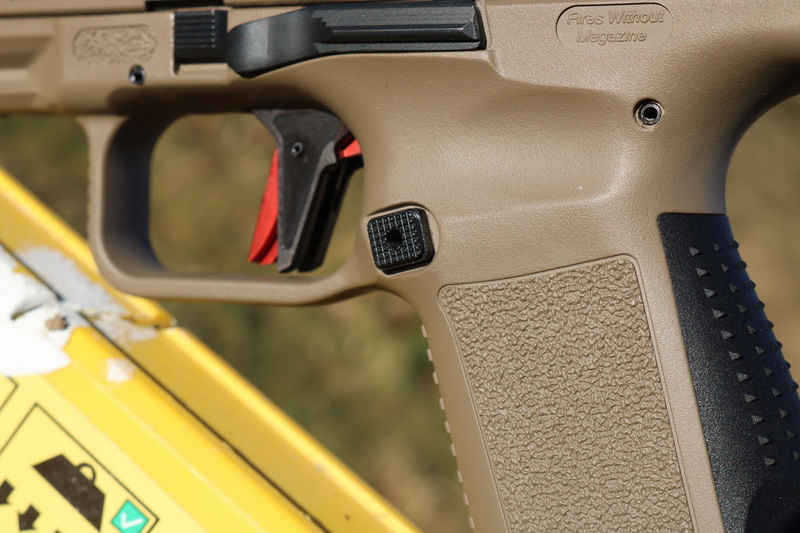 Starting at the bottom of the pistol, we do find said bolt on magazine well installed from the factory. You can remove it with one bolt, should you be looking for the slimmest possible option. The magazine well is what I would call a hybrid size, and fits the motif of combat gun quite nicely. By hybrid size, I mean a good mix of competition and combat needs. When we think of a competition magazine well, we tend to look for something insanely large, because the gun only has one purpose. We want slapping a magazine in to feel like throwing a penny in a 55 gallon drum. Perfect for making a sloppy speed reload work, but not so good for keeping your pistol slim and trim. The Salient model attached to the Elite Combat is big enough to assist in fast reloads, but not big enough to get in your way. The outer edges even have relief cuts, to further reduce the footprint. The mag well is aluminum, to keep the overall weight addition to the gun at a minimum. 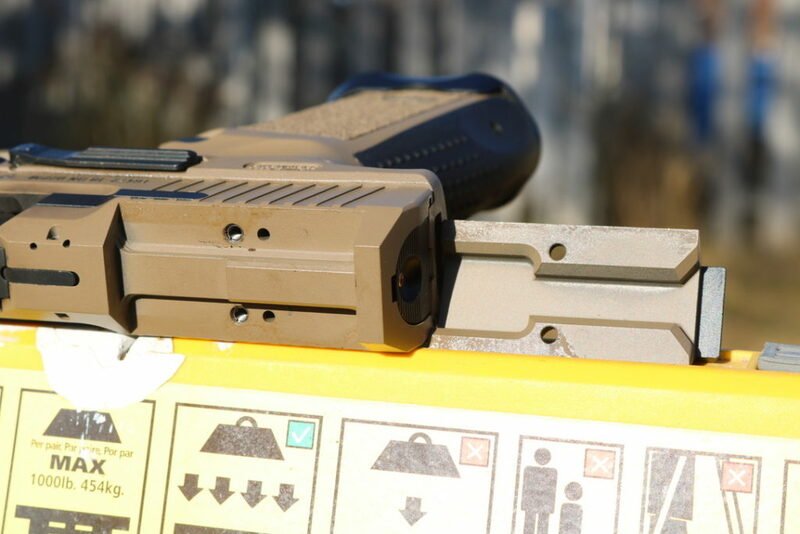 It will still pull double duty as a CCW gun if needed, without much added in the way of overall width. The back strap is interchangeable, with two sizes included. Removal is a simple roll pin. The grip and front/back strap feature a nice texturing pattern. The grip feels a lot like polymerized grip tape. Smooth enough not to interfere with your clothing, but an enhancement to your shooting grip. The front and back strap feature a blocky square pattern, almost exactly like a CZ P10C. It works very well on the CZ, and equally so on the Elite Combat. The magazine release is reversible for the wrong handed and features another unique set of options. 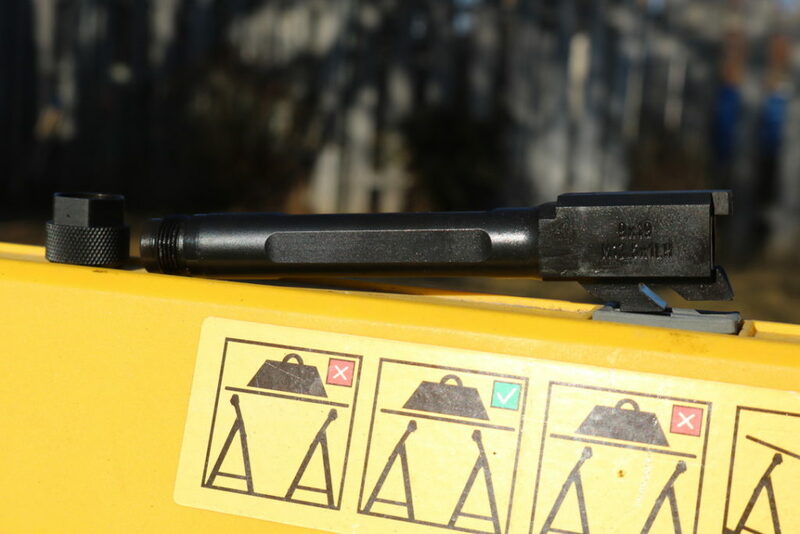 The button is held to a base magazine release via Allen head screw, and of such a diameter there is no fear of it breaking. The Elite Combat ships with the size Medium button attached, Small and Large in the box. Together, they actually yield 4 options. 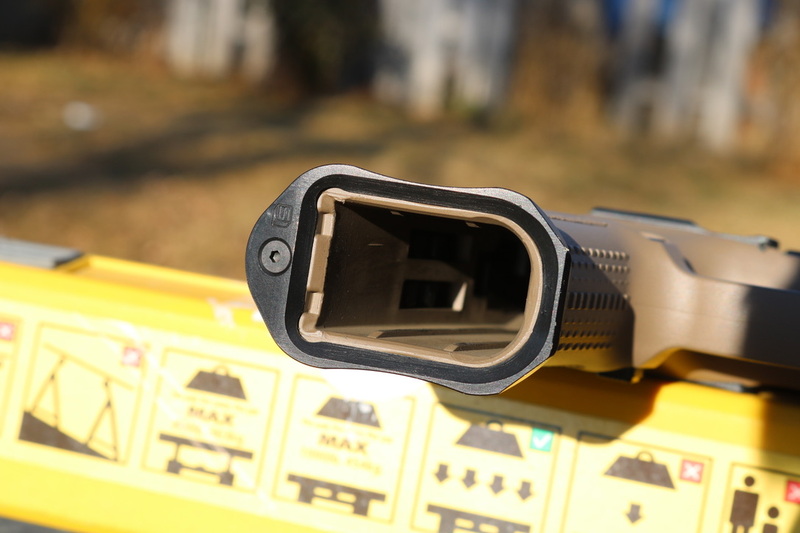 With the detachable button removed, you are left with a square mag release of appropriate size, checkered for grip, about the length of most factory mag releases. 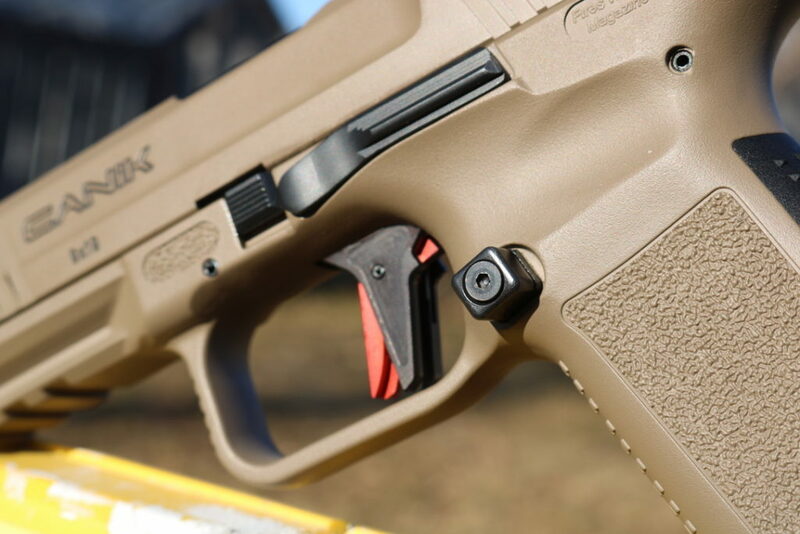 Adding the size S button yields a smooth top mag release, a little longer than most factory options. The M size is comparable to most brands extended magazine release. And the size L is absolutely massive, but perfect for those with smaller hands. The L is so long as to actually be annoying with hands my size but shows off another element of design. With the L installed, I still didn’t drop magazines by accident while firing, even with the mag release digging into my palm. The customization options here are excellent and makes this pistol fit a wide variety of hand sizes. The trigger is metal, with a flat face design. 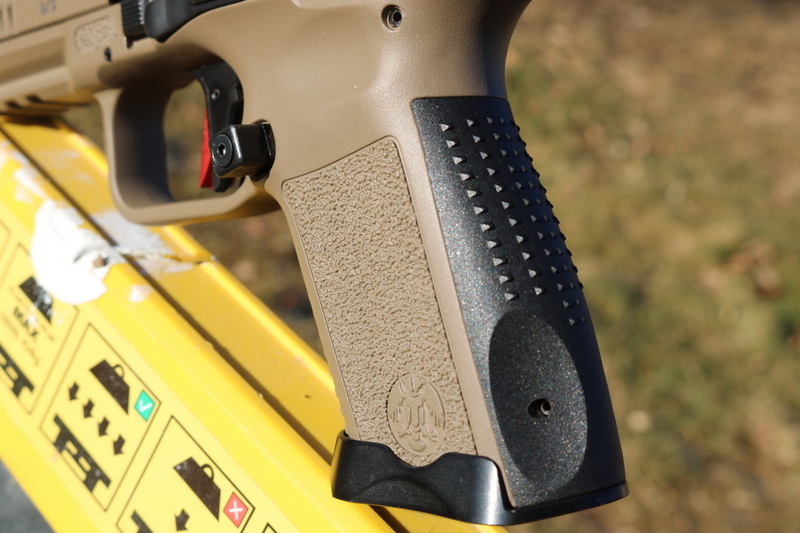 The safety tab is oversized, which makes the trigger very comfortable to use. You can see the benefit of this in a long day of shooting, no more crease in your trigger finger. The advertised trigger weight is 4.8 pounds, which I found a little on the heavy side. My own trigger gauge says 4.5, very consistently. From the look of the gun, and Salient being involved, I expected it to be closer to 3. But, 4.5 still beats most competitors, out of the box. And the Canik’s trigger is crisp, with a short take up and clean break. The slide release is ambidextrous, and a different design idea than I normally see on striker guns. This is common to the Canik family and is definitely growing on me. The slide release is rather narrow, reducing the profile of the gun, and ensuring you get slide lock with bigger paws. But it is long, giving you lots of real estate to hit when you want to drop the slide on a reload. I find the dimensions a very good compromise and works perfectly in practice. Narrow but long slide release. 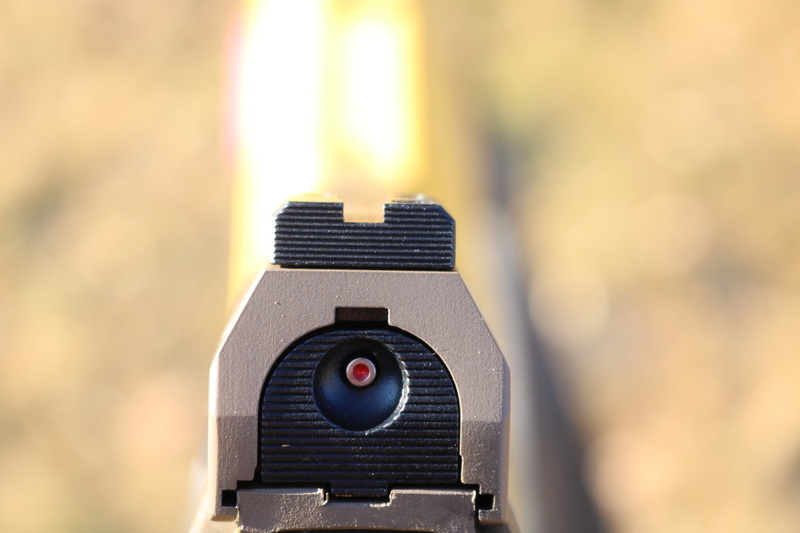 The steel sights are another Salient design, with a fiber optic front and black rear. The rear features a blocky racking shelf in front, with serrations for grip. The front and rear are both dovetailed in, so you can adjust either for windage if need be. 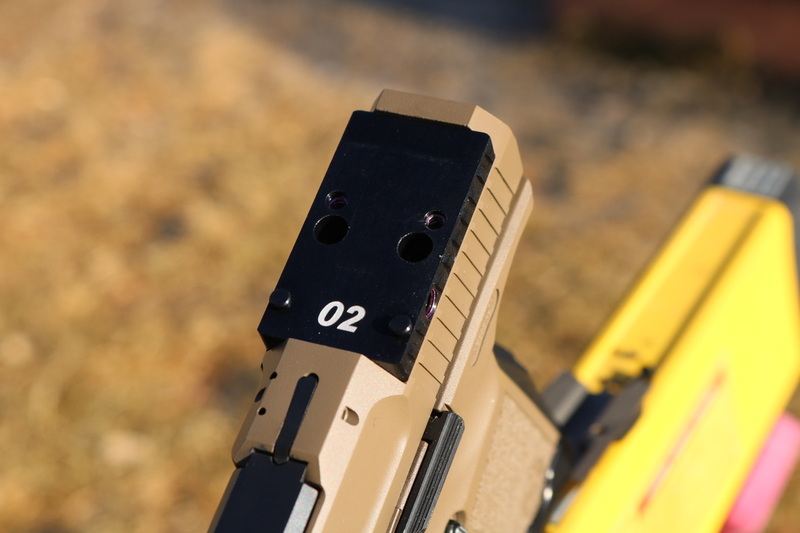 The rear iron sight is actually mounted to the removable red dot plate, similar to the SIG X5. While this does limit your options to red dot or irons, not both, it has become a fairly common solution. The removable plate is put on with beefy screws, a feature I find confidence inspiring. A personal pet peeve is either the red dot or mounting plate of a pistol held on with glorified eyeglass screws. Canik did it right on this part. The barrel is all Salient, fluted and black Nitride coated. It is billed as match grade, and my limited accuracy testing supports that. It has Salients proprietary convex thread protector, which also has nice features. It is knurled on the end for finger grip, like many thread protectors. But it also has flat sides and a wrench, in case you jammed it on with gorilla strength and can’t get it loose again. The design is also pleasing to the eye, another Salient strength. The barrel only has one flaw, at least in this typewriter monkey’s opinion. It is obviously threaded, yay for suppressor ready! But it is threaded 13.5×1 LH, an odd choice for the US market. 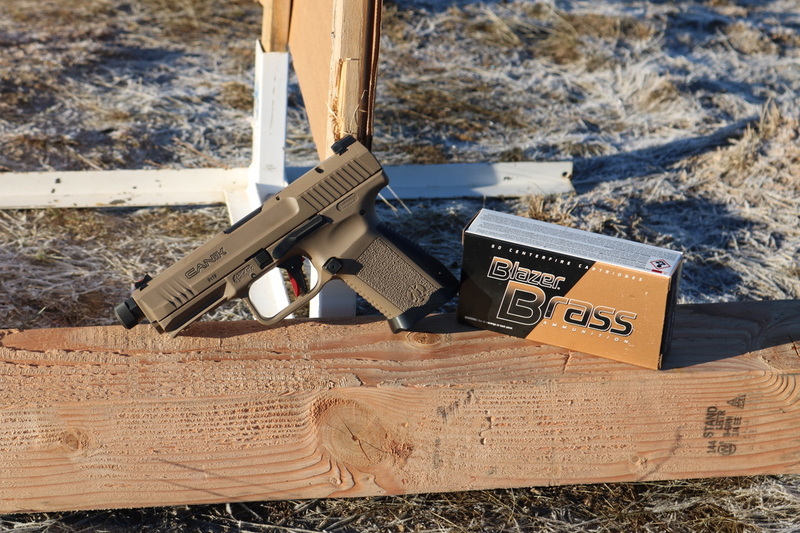 1/2×28 is the most common pitch for 9mm suppressors on this side of the pond. Why Canik opted for the common European thread pitch, I can’t explain. Fortunately, my SIG SRD-9 has detachable pistons in both thread patterns. With the SRD-9 attached, the Canik experienced no hiccups, with only about 100 rounds on the gun total. That is a high bar for suppressed pistols, as many require some break-in before they work right. I would rate the Elite Combat as an excellent in terms of suppressor host, provided you have one of the right thread pattern. Overall, the Canik Elite Combat is an excellent value. As the new flagship model for Canik, it sets a high bar. It is feature packed and a lot of gun for the price. At an MSRP of $850, it isn’t cheap. But it is loaded to the gills with nice to have options. For more information visit Canik by clicking HERE. First, I enjoy all articles written by Clay and second, why can’t these come out in 45ACP? I realize the 9mm is the “go to” round utilized by LE but how about showing some 45 love? I’d buy one in a second. Picked up a CZ P10C at local sports shop here for $430… bet if you held both in your hand blindfolded and shot them both (not recommending that you REALLY do that) you could not tell much of a diff. Make sure you get a chance to shoot both perhaps at your local range and judge if the cost diff is worth it. That CZ beat out my Glock 19 for bubba competition rounds we do on Sundays. I don’t own but have read lots of good stuff, (and a buddy also speaks highly of his). Wish they’d moved the red dot plate in front of the rear iron. Don’t like the either or, (red dot or irons). Prefer to have both available for when the red dot isn’t there, (malfunction, dead battery…). Know this from personal experience. Had my red dot die on the range but had irons immediately available. I put together a full race TP9sfx for that kinda money, that holds 27+1!!!!! I have a TP9 SfX that cost $450. 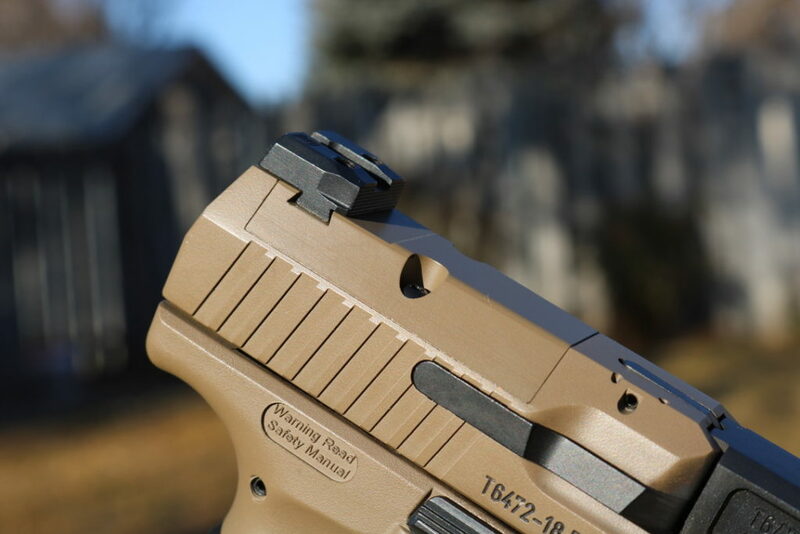 It is the Elite minus the flat trigger shoe, threaded barrel & the screwed on magwell. I don’t see how they can justify that price. How does this compare to my TP9v2,and when are we going to get the.40,that Cani k makes on our market ,I know it is anything like my v2 ,I would buy one in a NY second!! @Joe Gerardi: pricing out of the business – not exactly. Considering all the SAI-designed components vs. upgrade components for comparable pistols that would be added on after the initial gun purchase, it’s not that unreasonable. Seems like a nice gun. 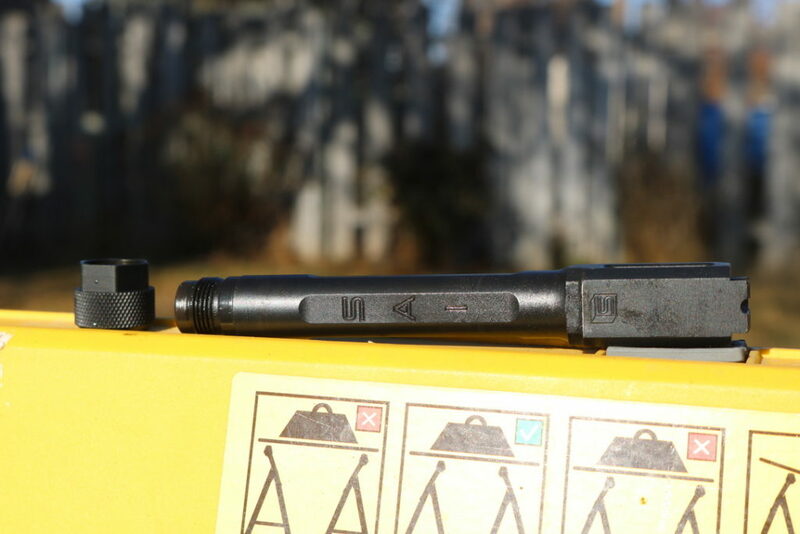 Although, if it has a threaded barrel, shouldn’t it have raised suppressor sights. If you used a suppressor with the gun, I would think that should of been mentioned. Or, am I missing something here? You’re not missing anything. This is my biggest pet peeve for can ready and red dot ready guns. 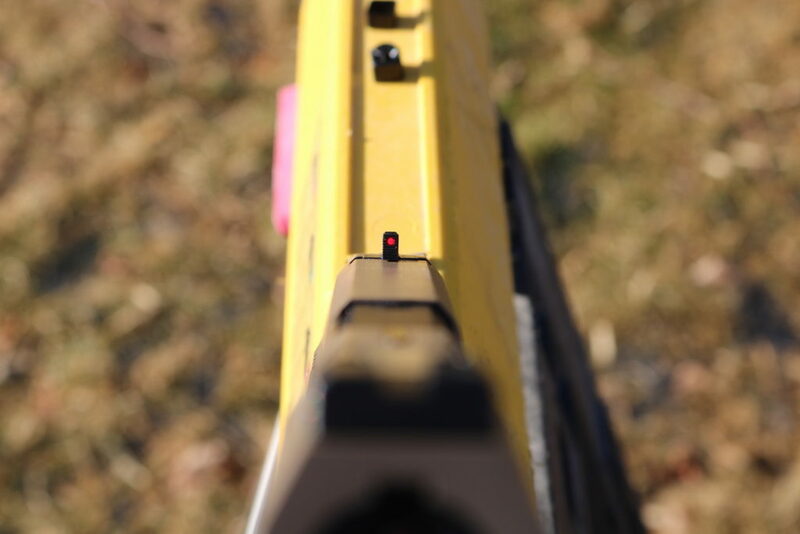 You’ll want the can height sights available when you’re using the can but you’ll also want to see your irons through the glass of the red dots. Some regular height sights can’t manage this so even if you have no plans for a can, you’ll want the sup height sights so you can see them if/when the red dots not there. 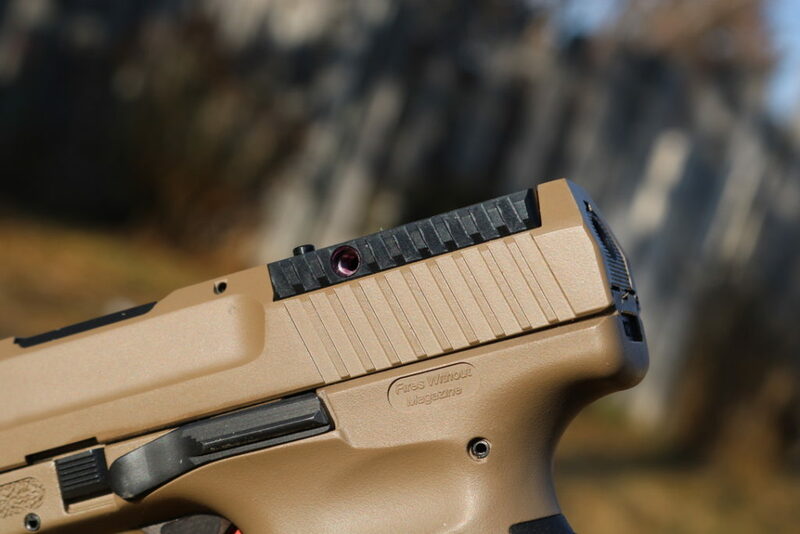 …no red-dot milling on the Sig TacOps…add $300 for that. When they make a .40, I’ll buy one. We need to make MORE noise so they here us! I to an VERY interested in,and would love to one!! This one, at < $700. Daily carry is a P239, so Sig fanboi here. Still, given the extraordinary accuracy and reliability of my Canik TP9SF Elite, this is the one to get, for me. Actually Joe If you look at prices @ several online gun stores the lowest price for the SIG is $699 and I found the Canik @ $649. Also the SIG doesn’t come optic ready, the Canik does, that’s alot of money if you want to have the Sig milled for it.